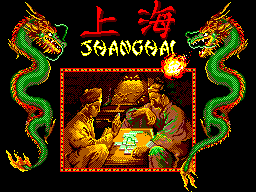 Shanghai contains no narrative as it is essentially just a console version of the popular Chinese board game Mahjongg. 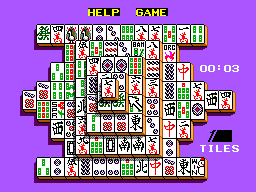 The object of the game is to remove all of the 144 tiles from the pyramid style "Dragon Formation". This is done by matching tiles that are classed as free. Free tiles are the ones on the left and right edges of the formation that do not have another tile next to it on at least one side. The main challenge is provided by the way in which the tiles must be removed in 72 turns. If there are no free tiles to choose from the game is over. I have found this to be the most addictive game on the Master System. It is the one game that I always play when I've got the Master System out. The game is easy to pick up and once you've learnt it you will not want to stop playing. It is also the type of game that anyone can enjoy. Okay, for a game of this type the graphics are never going to be amazing with great animation. However, the tiles themselves are large, bold and it is easy to see what is on each tile. 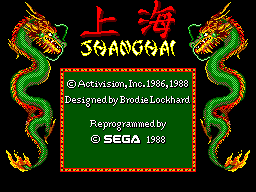 The graphics on the title and tutorial screens are of a high standard and especially the dragon that appears when you win a game. It would have been nice to have a different type of background whilst you play but it may make the tiles harder to see. There a only a few sound affects in the game for the selecting of a tile and cancelling a selection which amount to nothing more than a few pings. The game does contain a title track and a few songs to choose from whilst you are playing. Although they are nothing amazing I do like the default game music. I have found myself humming or whisling it on numerous occasions with it being so catchy. Great, very responsive and easy to master. Button 2 selects a tile and selects option in the game menus whilst button 1 cancels a selected tile or option. The D-pad contols the on screen cursor which is very responsive, however, there are times when I wanted the cursor to move alot faster. Also this is one of the few games that works excellently and is better suited for use with the Sega Sports Pad. Although I only payed �1.50 for this game I would have happily payed more for it. It has huge lasting appeal due to the random setups of the dragon as every game is different. It also has the tournament mode if you get bored of playing solitare so it has the potential to last months if not years of playing. This is one of my favorite games for the Master System. It provides a fun addictive challenge which I just find intoxicating and will last you a long time.